Putting aside the fact that Steve Jobs and Eric Schmidt were seen gulping lattes together in public on Friday, it is apparent that the two executives are in a bit of a feud. As Google’s Android creeps onto the iPhone’s turf, Steve Jobs, as well as other Apple executives have soured on their relationship with Google. Likewise at Google, the top execs aren’t as fond of Apple as they once were. Despite this growing resentment, the animosity at the top is not trickling down to the rest of the employees at Apple and Google, reports John Gruber of Daring Fireball. John says his sources at Google and Apple think the rancor between the two companies is “weird”. …This is a generals’ war. 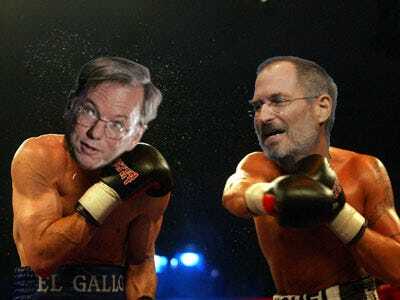 The rank-and-file at Apple and Google aren’t looking for battle, or even expecting it.